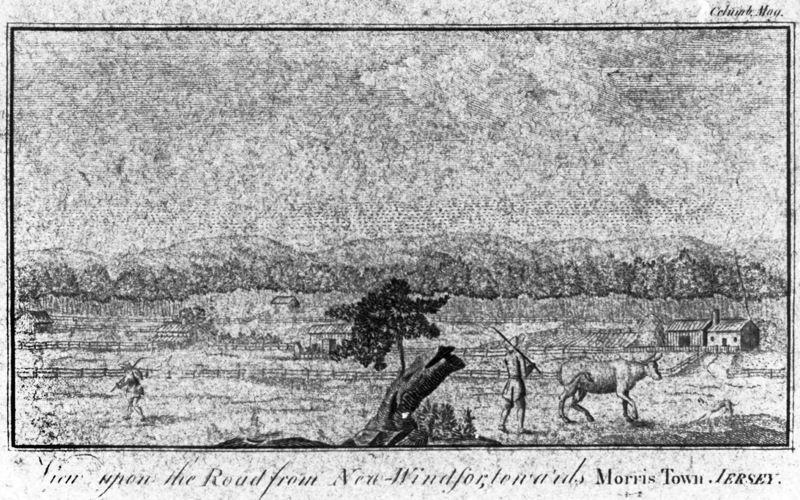 The first Dufford for whom we have records in America is Philip Dufford (or Johann Philipp Tufford/Duffort as he appears in various records). As with many settlers of this era from the Palatinate, the Duffords were fleeing from religious persecution of both Lutherans and Dutch Reformed. 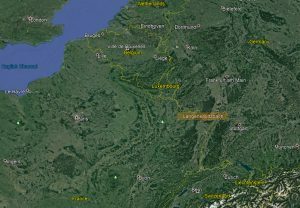 Although this generation left Europe from the Palatinate, it is thought that the family was originally French or Flemish Huguenot in origin, possibly named DuFort, Dufoor or Devoor. Many of the Huguenot families fled to the Palatinate in the mid-1600’s. Over time, they began to adapt their names and language to that of the Palatinate, so that by the time many of the families immigrated to America in the early to mid-1700’s, they were indistinguishable from the more German-oriented settlers. The Dufford family consisting of grandfather Philip Sr., son Philip Jr., his second wife, Anna Maria Martini, and seven children, including the ancestor in our line, Johann Adam Dufford, left for their journey from what was then Langensoultzbach, Germany. 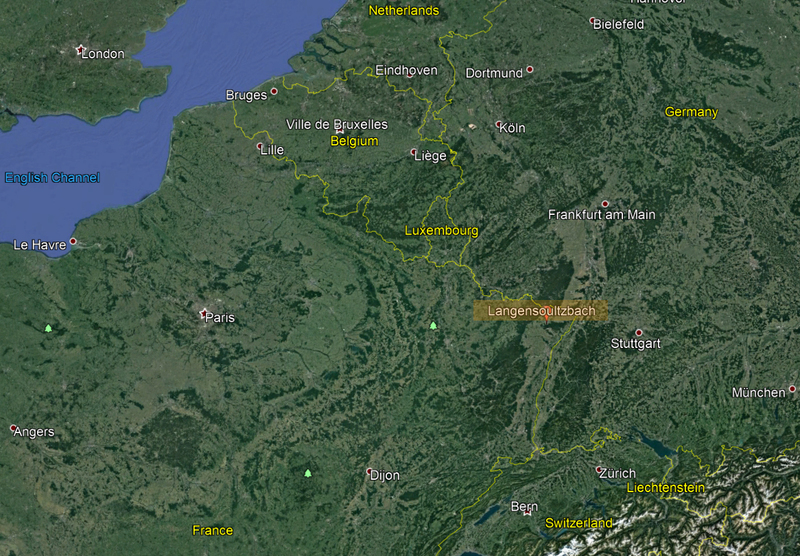 Langensoultzbach is now a few kilometers from Woerth, Alsace, France, and about 8 kilometers from the current French-German border. The Dufford family arrived in 1738 in Philadelphia on the ship “Robert & Alice”. The family had first made a six month journey down the Rhine River to Rotterdam where they found the ship and sailed to Cowles, England. This stop was apparently a requirement of the British government. From there, they set sail for the colonies. Although the ship was originally destined for New York, sailing was anything but smooth. The ship was blown off course to the south and reached land in Philadelphia on Sept 11, 1738 with 320 passengers. 38 of these eventually became some of the first settlers of “Long Valley” as it was called by the Indians. 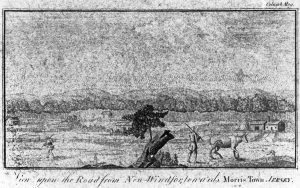 A group of Indians, send by an earlier settler, guided the new settlers from Philadelphia to Long Valley. 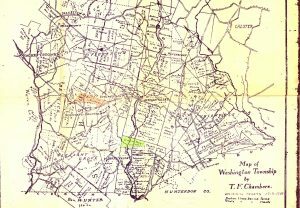 Long Valley is located in what is now Washington Township, in Morris County, New Jersey. In later times, this area became known as “Dutch Valley” or “German Valley”. However, in response to anti-German sentiments in the wake of WWI, the name was changed back to Long Valley. Johannes Wilhelm Welsh and Samuel Swackhammerhad had settled in the area around 1730, and then written to friends in the Netherlands, asking them to join them. 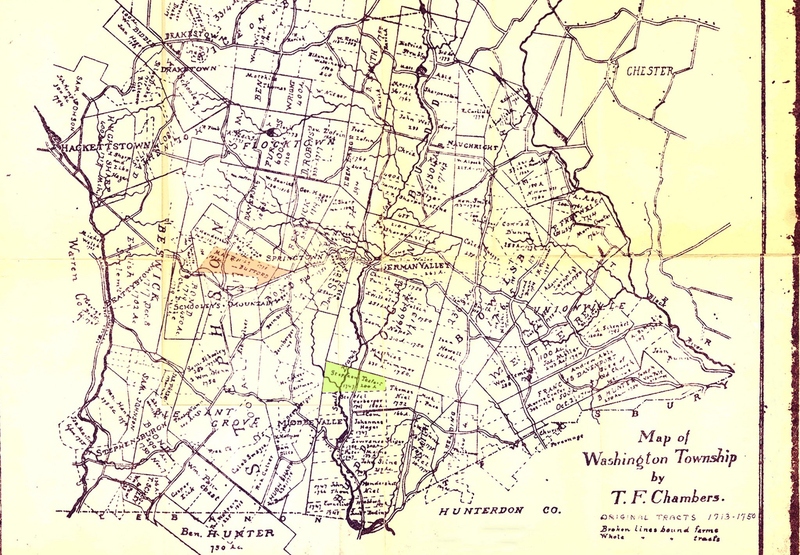 Much of the land in the valley was leased around 1747, including the Budd and Scott tracts, visible on the map of the early landowners from the late 1770’s shown here (click for larger version). Highlighted in green is one of the early plots of 200 acres, first leased to Jacob Dufford (spelled Tefort and Teford in the lease) in 1746 for 96 years. However, it is likely that this plot was originally settled by Jacob’s father, Philip, Jr., 8 years earlier, and that Jacob and also his brothers and sisters, including Adam, lived here those first few years. Philip had died in 1767, and Jacob probably predeceased him, so that the name on the map by 1777 is that of Jacob’s son Stephen. The plot of Matthias Dufford, another of Jacob’s sons and nephew of Adam, can also be seen, highlighted in orange. 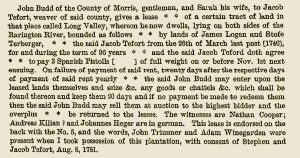 In the text of the lease we can read that the payment for the lease was to be three Spanish pistols. 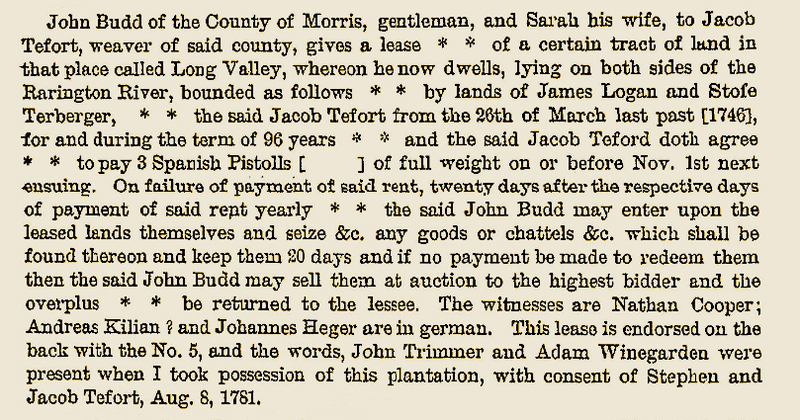 Some tracts changed hands many times and often no rent was paid due to disputes. This construction proved unworkable over time, as many of the original owners moved west but refused to give up their rights. Due to these disputes, many of the lessees refused to improve the land and eventually commissioners were appointed in 1844 to redivide the land, settle payments and issue definite deeds. However, long before this time, Adam Dufford had moved to Pennsylvania. By 1749, Philip and Jacob are listed as “Subscribers to Weygand’s Call”, for the second pastor of the local Lutheran church, but no other sons are named. According the “The early Germans of New Jersey: their history, churches, and genealogies”, he was found in records for Tewksbury Township, slightly SW of Long Valley, in 1758, and by 1771, he is listed in Easton, Pennsylvania church records, where he died in the winter of 1778 – 1779. Several of his sons and grandsons, including (another) Philip Jr. and his wife Elizabeth Gruver, moved to Butler County, Pennsylvania where many of their descendants are still found. See Descendants of Johann Philipp Dufford for more information. Philip Jr. and Elizabeth, with their children including daughter Sarah, arrived in the Butler area from Luzerne in about 1838. Sarah (left), who was born in 1836, married Peter W. Thomas in 1859. 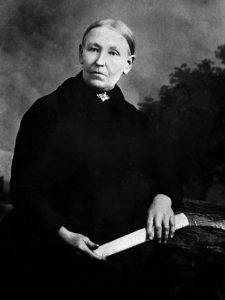 They settled near Petersville, Connoquenessing Township, on part of the farm owned by her parents, and remained married for over 50 years, raising a total of 8 children, including our ancestor Victor F. Thomas.